NYC is Blue: Empire of Soccer: "NYCFC seek homegrown claim on Wake Forest star Jack Harrison"
Empire of Soccer: "NYCFC seek homegrown claim on Wake Forest star Jack Harrison"
According to several sources, NYCFC are looking to claim Wake Forest midfielder and 2014-15 Gatorade Player of the Year Jack Harrison as their first Homegrown Player. 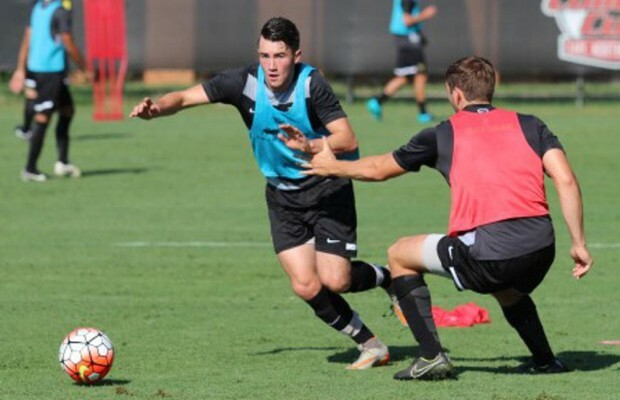 Harrison, 19, is a highly touted freshman at Wake Forest and a Manchester United academy product. His connection to NYCFC? Playing with NYCFC youth affiliate Manhattan Soccer Club for the past three years. Sources tell EoS that NYCFC hope the affiliate association this past season will be enough to qualify him as a Homegrown Player under the constructs of MLS. That argument, however, will face stiff resistance. In order to qualify as a Homegrown, Harrison must show that he has participated at the club’s youth development system for at least a year. His work under the NYCFC affiliate could qualify for that standard, but that judgment remains in the hands of MLS. There are also other, unspecified league rules that go into the Homegrown title, leaving Harrison’s status under review by the league. Harrison is already regarded as a top prospect in the college ranks, with many trusted sources placing him as a top five pick in the MLS SuperDraft.